The Nidderdale Chamber of Trade (NCOT) is delighted to announce that their Chair Keith Tordoff has been appointed a Member of the Order of the British Empire (MBE) in Her Majesty The Queen’s Birthday 2018 Honours List for services to Business and the community of Nidderdale. Keith has been a member of the NCOT for 25 years and has Chaired the organisation three times. He has been the current Chair since 2014. In this voluntary unpaid role, Keith has initiated a number of projects which have supported the community and economy of Nidderdale. that he was “surprised and quite emotional” when he received the letter informing him of the honour. “I was humbled to learn that people had put my name forward for such a prestigious honour. I have had to keep the knowledge of the award secret for some time and this has given me a chance to reflect on the strong community spirit that we have in Nidderdale, who all work together and take part in the Chamber’s initiatives. I see this award as recognition for all the amazing people in Nidderdale. Tim Ledbetter, Vice Chairman of the Nidderdale Chamber of Trade said: This is a fantastic honour and I hope that Keith and his family feel proud that all his hard work and dedication has been rightly recognised with the MBE. Keith is a great example of someone who goes above and beyond putting something back into the community and making a real difference. When first time as Chair, he helped set up the Nidderdale website www.nidderdale.co.uk in 1999 and worked with the Upper Nidderdale High School to have constructed a purpose built resource centre for use by students and the community. He also project led signage initiatives promoting Nidderdale with tourism signs and helped create the country’s first ever business fingerpost on the High Street, Pateley Bridge. In 2014 recognising that Pateley Bridge High Street, like many High Streets around the country, was starting to fall into decline with a large number of empty shops he once again became Chair of the Nidderdale Chamber of Trade. In this role, he felt he could help to regenerate the High Street and other businesses in the Nidderdale area. Following a number of cost effective initiatives including decorating the High Street and organising events, he then oversaw the Pateley Bridge entry into the Great British High Street Awards competition which is run by the Department for Communities and Local Government. Pateley Bridge was voted Best High Street in the country in the village category of the competition. Keith also Chairs the Pateley Bridge in Bloom group which last year entered the Yorkshire In Bloom competition winning the silver gilt award. Keith is the organiser of events which have without doubt benefited the economy of Nidderdale. The events include the successful 1940s event now in its fifth year and he organised the first Nidderdale Food and Drink festival as well as the inaugural Nidderdale Community Hero award. At Christmas, Pateley Bridge High Street has been transformed into a true winter wonderland. Nidderdale and Pateley Bridge through the Chamber of Trade have organised the celebrations and carnival atmosphere for the Tour De Yorkshire when it has come through the area. Nidderdale has well and truly been put on the worldwide map! All events are not for profit raising money for local community groups and charities. The Nidderdale Chamber of Trade publishes promotional and marketing material for the benefit of Pateley Bridge and Nidderdale. Keith writes weekly for the local newspaper highlighting community events which are taking place. He regularly is interviewed by local radio and appears on the TV promoting Pateley Bridge and Nidderdale. 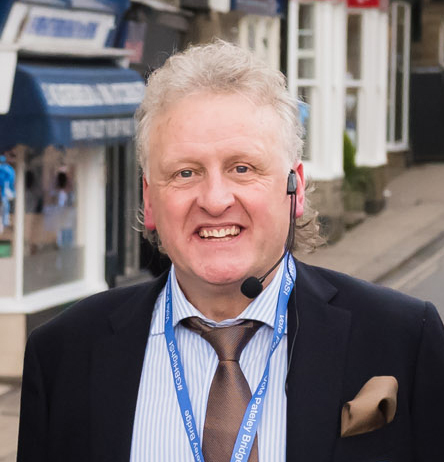 Keith who is the owner of the Oldest Sweet Shop in the World on Pateley Bridge High Street also gives talks in his free time on the background and history of confectionary. He does not accept a fees or expenses, instead asking for any donations to be made to charity. His nominated charity this year is Dementia Forward who are a registered charity based in Ripon, a charity very close to his heart.